Art Deco letterhead for a London garage in the 1920s. Homepage. This page: Stylish 1920s letterheadings in evidence in this garage correspondence regarding a Cubitt. A damaged Cubitt visits Camden Garages. Although un-dated, the Art Deco style of the following two letters suggests that they hail from the 1920s. 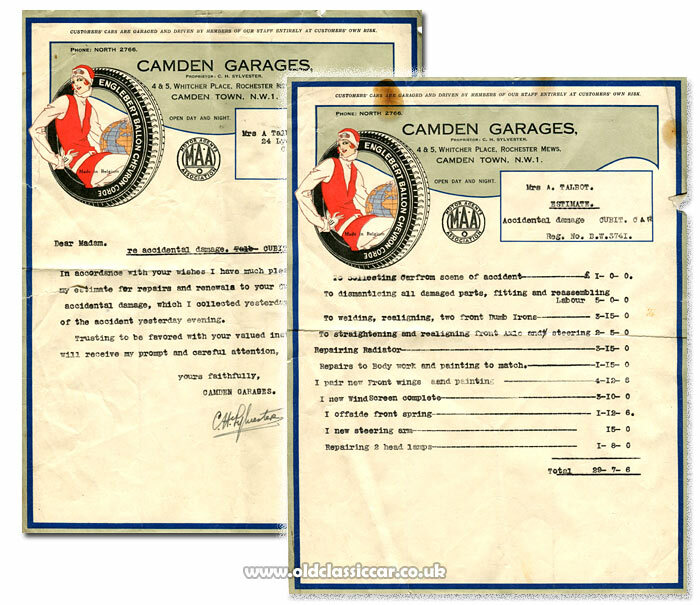 Of all the garage paperwork that now features in this section, these two items - for Camden Garages, of 4 & 5 Whitcher Place, Rochester Mews, Camden Town - are amongst the most attractive, thanks, mainly, to the advertisement for "Englebert Ballon Chevron Corde" balloon tyres. 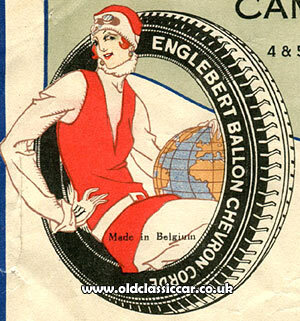 A stylish young lady is illustrated, sat within a gigantic tyre, a globe resting beside her. All very stylish, and light-years ahead of the un-imaginative printed letters and invoices that garages dispense today, at the press of a button. The two items of paperwork relate to an unfortunate incident that befell a Mrs A. Talbot, of 24 Lyon Street, Caledonian Road, London N1, or more accurately, to her now-vintage car - a Cubitt, registration BW 3741. Re accidental damage. CUBIT [sic] CAR Reg. No. BW 3741. In accordance with your wishes I have much pleasure in enclosing my estimate for repairs and renewals to your Cubit [sic] Car due to accidental damage, which I collected yesterday from the scene of the accident yesterday evening. The locations referred to in the letters. A search for Mrs Talbot's address on Lyon Street, reveals a much truncated road with a large 1960s office development close by. I wouldn't be surprised if the area suffered bomb damage during the war, which would explain a few, early, buildings, at odds with the much later offices alongside. The view below is from the Caledonian Road end of Lyon Street. A post-war view of Whitcher Place, home to Camden Garages and which happens to include in it the rear view of a Ford Prefect, can be found on this City of London image archive: external link. A PDF scan of a publication from 1936 refers to a taxi business being wound up, that had been running from 5 Whitcher Place as the JNP Garage, so perhaps Camden Garages had shut up shop by that time. Evidently motor-related businesses had operated at this location for some time, the Associated Omnibus Co. Ltd for example is recorded as operating from an address in Whitcher Place in 1905. Repairs required to the Cubitt. What we'll never know is, did Mrs Talbot go ahead with the repairs to her car, and if so, were they undertaken at this - or a different - garage? What is known is that no car of this registration is registered with DVLA today, so likely as not the Cubitt is no longer around. Certainly very few of the cars built between 1919 and 1925 have made it into preservation. Two vintage photographs of impressive Cubitt tourers can be found on this page in the vintage gallery, frustratingly neither cars' registration plate is visible. More period items relating to cars and related businesses can be found in the Motoring Collectables section of the site.